From an organic store, Almanna Organics at one corner in Khazanah Plaza Sukajadi Batam, this is all started. We supplied good quality of organic products to many restaurants in all over Batam. Then we thought, why don't we start our own restaurant, using our good and healthy products added with a warm and kind service that comes from the heart . Then Piccola Stella d'Almanna was born, The Little Star of Almanna. 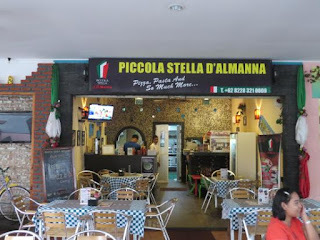 Where everyone can find the star quality of great food and service at one corner of Batam Island, Indonesia. We wish the little star will keep shining, since we also use the profit to support many children in education. We wish these children will grow and shine bright too, just like a star.